Fasting – Matt 6:16-18 from Luke McFadden on Vimeo. This idea was born out of a desire to be “the church” in our neighborhood. This isn’t a systematic plan to invite people to church, though that’s not necessarily a bad thing. Rather, it’s about building relationships and developing community so that we can love others. If we base the value of our relationship with our neighbors off wether they come to church or not, then we’re missing the point. We must value our relationships even if our neighbors never come to church, after all, the Church isn’t a building. Hopefully that doesn’t sound harsh, but if it does leave me a comment and explain why! I’d love to chat this up. 1 Site License for the Ideabook with over 50 Ideas– Make as many copies as you need! Want to purchase? Have more questions? The video mentions an Ideabook which will transform your life has some simple ideas to get your brain churning. Here are a few sample pages to give you a feel for what’s included. I’d love to hear you thoughts on the video itself. What did you take away from it? This post might not be helpful (or make any sense) to most people reading my site, but I’ve spent a LOT of time today scratching my head in utter frustration. I’m making some Motion Scripture for the Preposterous Project (I’ll post the video when it’s finished), a fairly simple 30 second clip. The clip has a light flare transition at the beginning and end, so the clip needs to have an alpha channel in order for it to work smoothly for the people who I’m handing it off to. 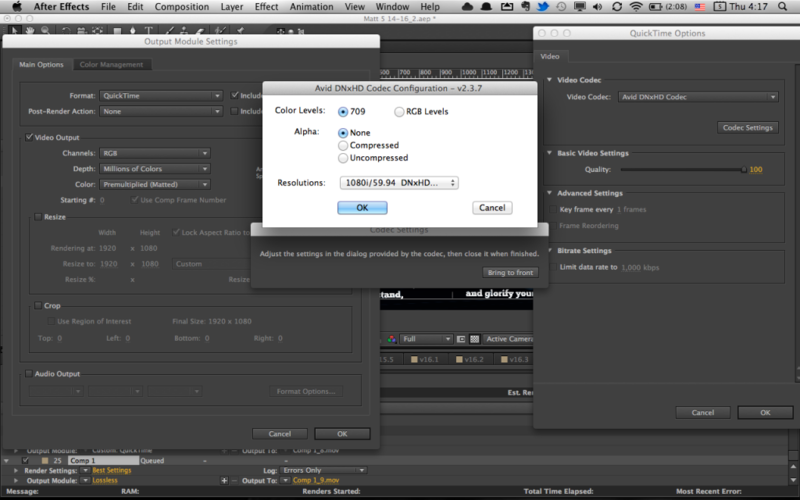 In After Effects, I’m fairly limited on my RGB+Alpha options within Quicktime. The Animation codec was rendering files that where 2.5GBs (for 30 seconds!). So after I did some poking around, and talking with peeps (or maybe tweeps?) on Twitter, I settled on using a codec that I had heard of, but never actually used. Avid’s free DNxHD. I downloaded it, and was pleasantly surprised with the codec options, allowing me to cut the file size down to 1GB. Then find the four lines containing ’AVdn’ that say decode. Change the decodefourcc at the end of the line from ’2vuy’ to ’argb’. You’ll have to do this every time you update CS6 (this problem doesn’t happen in CS5 and CS5.5) until Adobe address the issue. So, hopefully this post will be helpful to SOMEONE out there. If you have any questions about the DNxHD codec, let me know and I’ll share my settings!